”Sight words” are a special category of words that students are instructed to recognise automatically (i.e. without picture cues or sounding-out.) The instant recognition is important due to the frequency at which sight words occur. Over half of every newspaper article, textbook, children’s story and novel is comprised of just 300 words (Fry, 2000:4). What are the origins of the sight word lists? The first 25 words on his list word list make up approximately a third of all published works. The first 100 words on his list word list comprise approximately a half of all published works. The first 300 words on his list word list make approximately 65% of all published works. Beginner readers and the sight words. It is well established in the literature that students require simultaneous instruction of phonics and sight words. Both sets of skills have been shown to assist beginning readers. A complication with sight word instruction is that a proportion of the sight words do not follow regular phonic rules. Another compli­cation is that those words that do conform to phonic principles demand phonic knowledge that the beginning reader may not have yet acquired. Methods to instruct each sight word. Beginning readers require the presentation of more simplistic high frequency words before the presen­tation of more complex and irregular high frequency words. While the sight words are still presented in Fry’s groupings (i.e. the first 25, followed by words 26-100 and finally words 101 to 300), it is within these groupings that the order has been updated to consider word complexity. This order presents words ranging from the regular (and easiest to master) to less regular (and more difficult to master). For the beginning reader this will facilitate greater success and reduced frustration. This is a two-stage strategy. First the ‘sounding out’ strategy is applied and it produces a non-word; but when the beginning reader stops for a moment to think about the sounds that were produced they are often able to arrive at the associated “real” word. For example: • Was: It then needs to be explained to the student that when sounded ‘wahss’ is produced, but when the word is read (and spoken) it is verbalised as ‘woz’. Over time students will not require the adult’s explanation. (For example: Child: “W-ah-ss. Oh I know! That is that tricky word woz”). With a little more exposure and rehearsal students will not require ‘strategy 2’ and will instantly read the word as “woz”. Phonic knowledge assists the mastery of a significant proportion of the list words. The difficulty for beginning readers is that their knowledge of how alphabetic symbols are combined to represent sounds contained within words (i.e. phonics) is extremely limited. 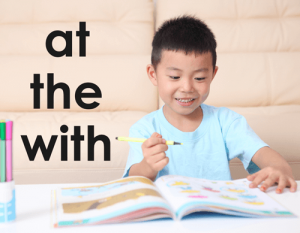 • The alternating black and grey colour coding of the sight words assists the beginning read-er by highlighting the sound and phonic structure in the sight words. However, when students would benefit from the explanation of a particular phonic concept, this is indicated by the phonic symbol being highlighted within the book icon in the left hand corner of the flash card. For example: ‘ea’ representing an “eeee” sound greatly assists a beginning reader decode the word ‘each’. Where possible, it is recommended that ‘strategy 3 sight words’ are linked with class-based phonic spelling lists. Do students just need to read the sight words? It is common for students to learn to read the words with relative ease (i.e. by sight) but then to lag with their ability to spell the words. Full and deep sight word mastery requires students to master both the rapid, automatic word recognition and also the ability to spell the words. It is recommended that teachers present beginning readers/writers with a phonics-based spelling list (e.g. way, stay, tray, day, May, play etc.) along with 2-4 sight words. Over what period of time should students acquire the high frequency sight words? Fry (1999) states “An average student in an average school situation learns most of the first 100 words toward the end of the first year. The second hundred words are added during the second year. It is not until sometime in the third year that all 300 words are really mastered …”. (Fry, 1999: 43). Fry goes on to explain the remainder of the ‘1000 Instant Words’ are recommended for students within Year 4 and 5. Hence take time to introduce, revise and consolidate the word lists in reading, spelling and writing before progressing onto more complex words. Beginning readers and sight word acquisition. Fry cautions “Just because students have mastered the list words one day, don’t be surprised as they don’t remember all the words the next week. This is why review and more practice are needed.” (Fry, 1999: 45) Demonstration of sight words’ spelling ensures a deeper level of mastery of the words than just reading recognition alone. Dolch, E. W. (1936). A basic sight vocabulary. The Elementary School Journal, 36(6), 456–460. Education Department of South Australia. (1984). Salisbury word list. In Education Department of South Australia (Ed. ), Spelling R–7 Language Arts (pp. 73–80). Adelaide: Education Department of South Australia. Fry, E. (1980). The new instant word list. The Reading Teacher, 34(3), pp. 284–289.